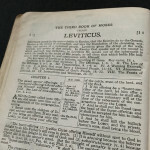 Mark Combs Author » Blog Archive » LEVITICUS? REALLY??? When I opened this morning’s MIQLAT Newsletter from Dr. Michael S. Heiser, I was greeted with a pleasant surprise. The newsletter is always filled with excellent material for anyone who enjoys biblical studies, but this morning I noticed a new study guide had been made available via Amazon Kindle – The Book of Leviticus. That’s right, I said (or wrote) Leviticus and I know what you’re thinking… “Well that’s got to be a borefest to immeasurable degrees.” Actually, you’d be wrong (and wrong by more than a little). Whereas I was familiar with Leviticus, I had never really studied the book prior to coming across the study on Dr. Heiser’s Naked Bible Podcast. I listened as he worked his way through the book and was absolutely captivated by the insight available within its pages for anyone who wants to know more about their Creator. It was a wonderful study and I highly recommend it for anyone who wants to step away from the routine pat-you-on-the-head-and-scratch-behind-the-ears Bible Study. Now that I’ve downloaded the study guide (available for only 99 cents), I plan to listen through the series again. And, if you’re one of the 4 or 5 people who actually read my blog postings (and curious about biblical stuff) I’d like to encourage you to do the same. I’d bet 99 cents (for entertainment purposes only, of course) that you’ll be glad you did. To view the study guide on Amazon, click on any of the links that say study guide or the image icon for this blog post. NOTE: I keep comments on my blog are closed because I don’t have the time to manage them and respond in a timely manner. If you would like to leave a comment about the Leviticus Study Guide, please do so on Amazon. It helps the author & publisher when people do that.